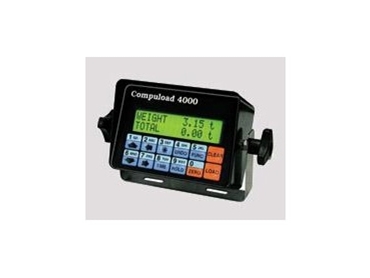 The Compuload 4000 weighing systems from Instant Weighing will operate in the heavy machine industry as a complete bulk materials handling system. Featuring data storage, simple operation, flexible programming, rugged design and extraordinary accuracy the Compuload 4000 is an asset that pays for itself rapidly. The data storage function allows for data and information to be stored in three separate fields, customers, products and trucks. Information can then either be viewed on screen, sent to the optional printer, or downloaded to a laptop or PC. The operator doesn’t need to worry about input as the system will automatically weigh the load once it is lifted. The compact design of the weighing system ensures visibility is not hindered and they are designed to operate on 12 or 24 volt systems and high temperatures and also with stainless steel construction to withstand vibration and harsh environments. They systems are proven in all types of applications and environments and with an accuracy of of +/-1% (typical) the weighing system quickly pays for itself and becomes an integral part of an effective OH&S system.